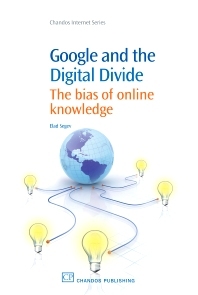 Beneficial to scholars and students in the fields of media and communication, politics and technology, this book outlines the significant role of search engines in general and Google in particular in widening the digital divide between individuals, organisations and states. It uses innovative methods and research approaches to assess and illustrate the digital divide by comparing the popular search queries in Google and Yahoo in different countries as well as analysing the various biases in Google News and Google Earth. The different studies developed and presented in this book provide various indications of the increasing customisation and popularisation mechanisms employed by popular search engines, which together with “organising the world’s information” inevitably also intensify information inequalities and reinforce commercial and US-centric priorities and agendas. Elad Segev is a postdoctoral fellow and lecturer of Media and Communications at the Hebrew University in Jerusalem. He dedicated his doctorate work at the Research Institute for Law, Politics and Justice at Keele University to study search engine biases. His research also deals with technology, primarily the Internet, and its social, political and cultural implications. Additionally, he serves as a visiting lecturer of new media and network theory at Ben Gurion University and Emek Yizrael Academic College in Israel.